This recipe was a happy accident. Others accidents I have experienced have been far less joyful. Take for example the time that I gained rather painful third-degree burns on a delicate part of the anatomy, upon backing into a wall heater. In my defence, it was a cold and wintery Melbourne morning and the heater was irresistibly warm. No cheer found there. Then a few years ago, I boarded a train, holding Kid 2’s pram with one hand and attempted to open the train door with the other. Pushing the door with undue force, I overbalanced and slipped into the gap between the train and the platform. Dangling from the train door handle, I utilised my superhuman strength and propelled myself upwards. My shoulder was badly damaged but I did have the wherewithal to let go of the pram when I slipped. Could have been worse but again, not happy. Or the time that I haphazardly found myself in the middle of a bar fight that had nothing to do with me and was punched in the face. That experience provided very little glee indeed. 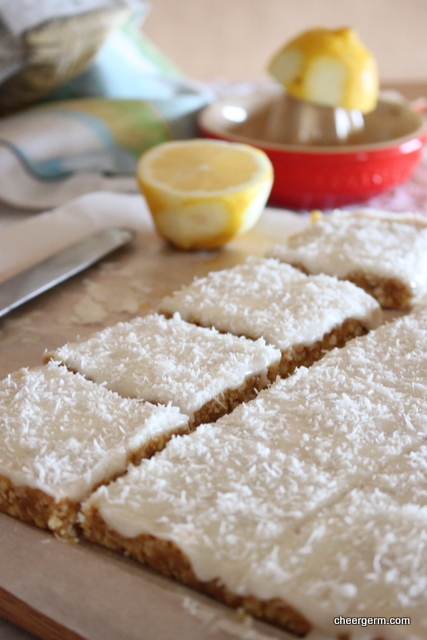 This tasty no-bake slice is just as good using either gluten free or regular store purchased biscuits. 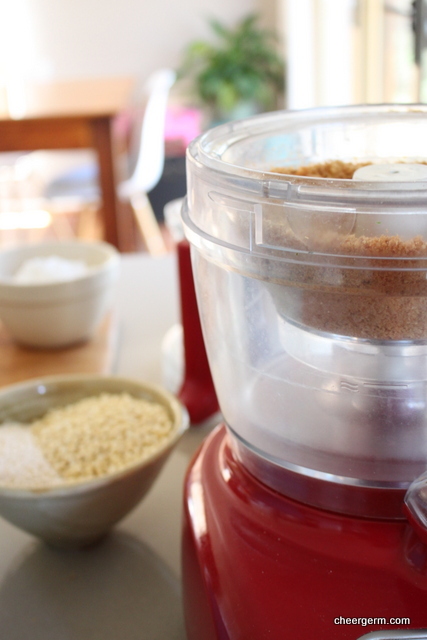 The recipe required 250g of biscuits but my pantry only coughed up a mere 160g packet of gluten free Anzacs. What to do? With the temperatures set to unseasonally and prematurely soar to 37 degrees Celsius there was no way that I was getting in the car to go shopping. It was also a public holiday and lassitude ruled the day. Necessity once again being the mother of invention, my beady eyes happened upon some bags of puffed amaranth and millet. A cup of each was added and Eureka! It worked. Chewy, cold, buttery and sweet, this fridge slice is balanced by a superb lemony punch. A happy accident indeed and so much more enjoyable than a real punch in the face. Trust me. Line a lamington tin with nonstick baking paper. Place condensed milk and butter in a saucepan. Stir over gentle heat until the butter has melted and the mixture has combined. 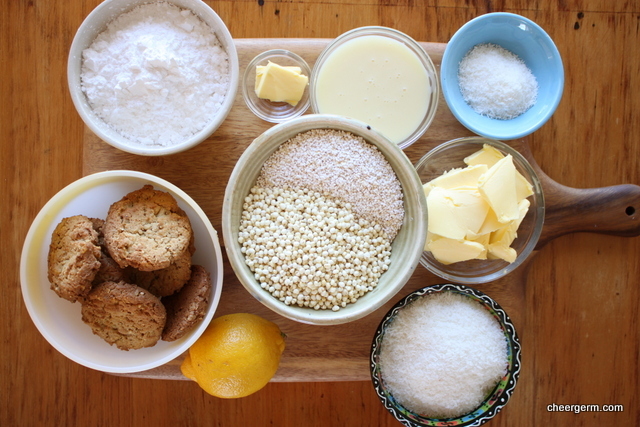 Place the biscuits into a large bowl, add the lemon rind and coconut. Mix well. Add the condensed milk and butter to the biscuit mixture. Mix well. Press the mixture into the tin, my slice was about 1.5 cm thick and about 24cm long x 23cm wide, it didn’t use up all the tin. Refrigerate for one hour. Icing: Combine the sifted icing sugar, lemon juice and butter in a bowl. Mix well until smooth. 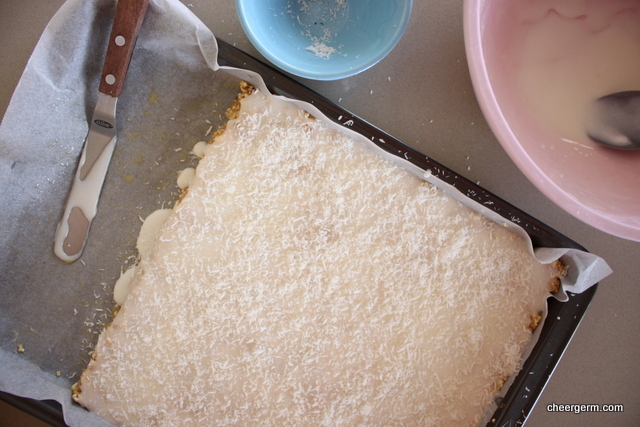 Spread over the chilled biscuit base and sprinkle with the coconut. Refrigerate until the icing is set, cut into small squares. A Cheergerm adaptation from a recipe found on the Allrecipes website. 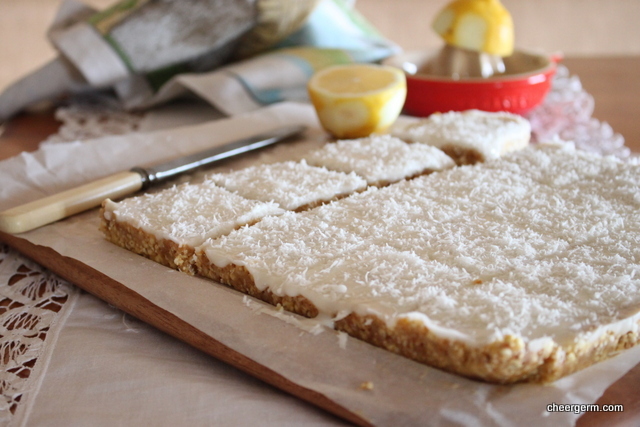 This entry was posted in Gluten free baking and desserts, Ponderings and tagged baking, cheergerm, coeliac, Cooking, food, gluten free, gluten free lemon coconut fridge slice, Humour, lemon, lemon slice, recipes. Bookmark the permalink. A happy accident indeed – these look yummy. Your pram/train slip up sounds like a nightmare, one I’ve often feared falling into myself. Now I know why they’re always saying ‘Mind the gap!’ on the tube. Hope you stay out of trouble for awhile, unless it’s more tasty inventions like this one! Some of my best creations were “accidents”! These look lovely! He he he..😂. Well, I am extremely careful near trains and heaters but I do visit bars still, yes indeedy. Yes, tweaking things is a bit of a habit with many of us and I think the mark of a good cook is thinking on your feet and making it work, one way or another. This really was nice and I loved the puffed grains. Gave it a different texture. That gap accident sounds terrifying! 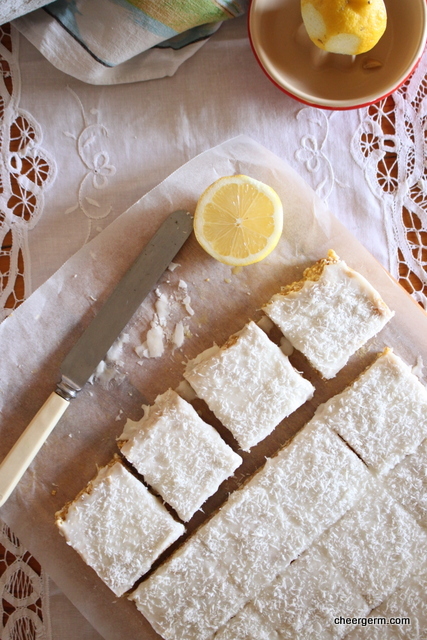 I can almost smell these lemon bars (we say “bar” instead of “slice”). And they are so pretty and festive with the white icing and coconut. They’d be nice for a wedding shower. Well this is a happy accident but WOW, that accident with the pram is so scary as is the unhappy incident in the bar At least your kitchen accident had a very happy ending because this cake looks delicious. Thanks so much, it is a great wee slice. 😊 I can look back and laugh now, mostly…. Oh Ms. Cheer! What harrowing tales! I think you need to elaborate more on that bar brawl for those of us hungry for nitty-gritty details. if you had these delicious treats on hand I bet you could have prevented the brawl to begin with. As I am violently lactose intolerant I cannot make them but I am always drawn to lemony desserts like this one. Dang it. Wow I never would’ve thought of you in a bar fight even if you were just an innocent bystander! So sorry about all your mishaps! 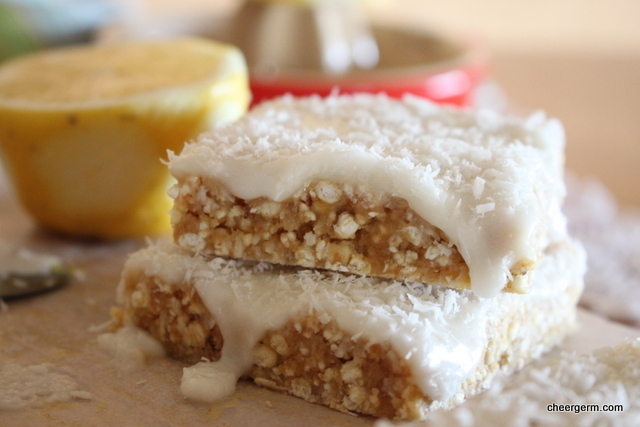 But another lovely post with pristine snaps of a yummy-looking snack…….you really need to be doing this for a living! Thanks PR and welcome back. 😊 I have a knack for being in the wrong place at the wrong time, I have a few more stories up my sleeve on that account. You always say such lovely things. These bars are really delicious. Have a beautiful day. I am so paranoid about train gaps and now you’ve made it worse. My mind shudders. Love these lemony biscuits and the lemony pop provided by the happy accident. Even though getting punched in the face suuuuucks, I kinda want to hear more about this story, haha. Beautiful work once again madam. Eeeek to all of your unhappy accidents of the past cheergerm! So lovely to see this slice though… one of my favourites, though am intrigued and will have to try the puffed grains – it really would give such a different texture! I like to think that these accidents are preventing me from more deadly accidents such getting hit by a bus…or something potentially quite life ending. That’s my theory Anyhoo…Thanks, it’s an oldie but a goodie. I enjoyed the textural difference and the kids didn’t seem to care, phew! If these lemon bars are as good as the stories you just told, I’ll be surprised if they last more than a day 🙂 So creamy looking!